Wonderful! Get your cleaning mixture in it and pull it around from room to room that needs mopping! Best purchase that I made for cleaning. I enjoy this mop a lot.. it is very easy for me to use due to I have Parkinson's.. I'm just sorry that I haven't tried this product before now. Like I said in the above statement, I just sorry that I haven't tried this product before, for people like me that have carpal tunnel it is God sent. I will order extra heads when the time come for a replacement. Again Thank you for a very good product that will help me out a lot around the house. I like the spin, easy to rinse mop. It is simple to use and very easy to mop with in corner. 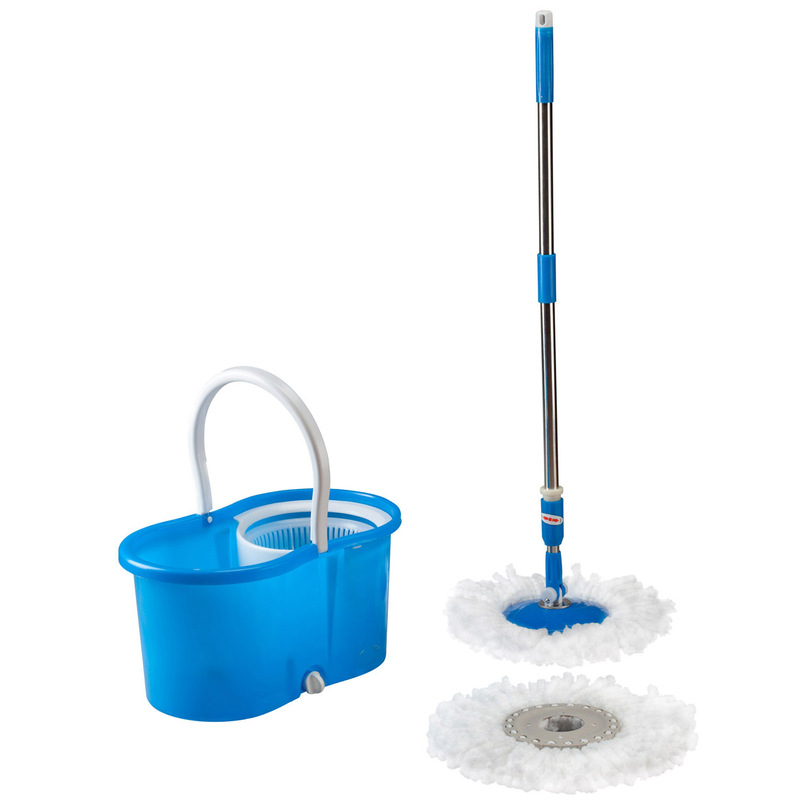 Love this little spin mop and bucket. I keep it in my Motorhome when I travel. Just the right size to keep in the shower and use when accidents happen. Can not live without it. liked the operation of the mop & the rinse out of the mop. liked that it came with 2 heads. I love this mop!!! No touching dirty water!! Mop heads are washable on the GENTLE cycle and air dry. I put mine in a mesh bag before washing. Loosening the handle is a bit tricky at first, but you can't spin the mop without a loose handle. 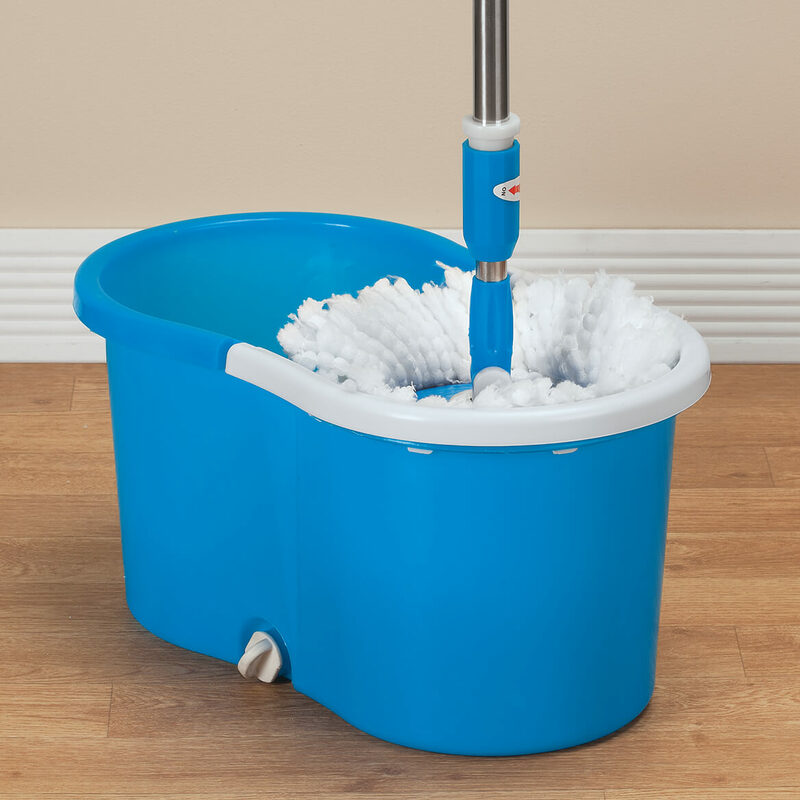 The spin bucket gets a lot of water out of the mop head so that it is not dripping. This is worth the money!! very good mop does not sand up streat. I just love this mop! It almost makes mopping fun, well almost. I would recommend this product to all! I breed and rescue dogs so I am forever mopping my kitchen floor. This is the greatest ever. It dries so quickly and gets the floor clean in a breeze. This is light weight and easy to wring out. For people with arthritis it keeps from putting too much water on the floor. Washable heads keep from putting dirt back on the floor when you mop. Wonderful product. after using mine 5 people purchased the product. I have used this several times since purchase...at first directions aren't very clear..but thru trial and error got it right.I am hoping that the "on/off twist mechanism will last! !.The mop head is not machine washable..nor too thrilled about washing it by hand..I live with son and his family..3 kids..youngest is only 16 mo.old...need to clean the floors often..this hopefully will be a true helper for me. I have used this once. It is hard to use the spin bucket. It could have been made better. I love the CONCEPT...a mop that takes the strain off your back. BUT after 4 uses, the bottom of the bucket developed a large split and is TOTALLY unusable. Now the.mop is useless as it uses the bucket mechanism. Terribly disappointed. The base of my mop will not allow the handle to stand upright. I have unscrewed it thinking it was shipped incorrectly but still does not work. I'm sick of trying and will attempt to use this waste of money as it is, with a bent handle and unable to spin. It doesnt work well to get excess water out of the mop. I should have bought a regular mop, several of them, for that price. Might as Well Scrub the Floors by Hand! I would not bother with this product! Save your money and get a swiffer! The mop head is a huge circle that prevents you from getting in corners or tight spots, and the water never wrings out, so it is just a big, sloppy MESS! I would give this product a zero out of ten. This mop was not what I expected. It is impossible to use like they say on tv. Please DO NOT BUY THIS PRODUCT. You will be sooooo disappointed. The quality of the product is poor. I'm not sure if I will ever use. I'm really disappointed with my purchase. This was a very misleading item. The handle of the mop would not fit. When I tried to get it to spin it would not. I am a very loyal customer and will continue to be but will not order anything like this again. It did not even have any papers with it to show how to do anything. I feel I just wasted the cost of this item. I would return it but like I said I tried to use it so I don't suppose there anyway of getting some form of credit for it is there? It says that you put the mop head into the part that spins & as you go up & down the mop head will spin dry. Well, it only spins WITHOUT the mop head it it. Don't waste your money. I bought this product to use in my living/dining area. I have two small dogs that on occasion will slip up thus I thought having an all around product that would allow me a clean mop each time would be nice. The one thing that was nice about it is it is small and compact; however because this product is so small it did not clean my entire living area without having to change to water so much. Do not purchase this if you plan on using it in larger areas and expect to change the water a lot. This product is definitely not worth the money. Small. Drainage plug not threaded for secure closure at base of unit. After watching videos of people using this as an off grid washing machine, I decided to "give it a whirl "as Kevin would say in Home Alone. There is no way to wring the excess water out of clothes. I did not read where the foot pump is sold separately. This will be the last purchase I make from Miles Kimball. It took forever to arrive, and when it did the tracking number was written on the box. The carrier stated that she had NEVER seen that before and I stated that I hadn't either. Had I know beforehand that it does NOT come with the foot pump to wring the water out I would NOT have placed my order! This is something I've had before and I love it. Light weight, easy to use, & handy. I have heard about this product and think it will help with all the spring and fall house cleaning!!! No more bending and ringing out!!! I chose this item to keep my hands from the dirty water off the floor. Household chores and was told it worked great. Because the person that it is for has used mine and loves it. My friend has one and swears by it! BEEN WANTING THIS ITEM FOR A LONG TIME. CAN'T WAIT TO GET IT! Seen commercials n really wanted to try it. I was given this mop and bucket system and I love it! Takes the drudgery out of mopping floors. Bought some sets to givve to my daughters. I have owned one for several years and love it. The spinner is wearing out. I have seen other brands that seem to work well. I need an better way to mop and I have trouble using regular mops. I have wood floors and can't have water standing on it. Needed it to clean floors. Because I don't have much strength left in me to squeeze out a mop, and the Swiffer wet-jet leaves streaks on the floor from whatever is in the solution. BEST ANSWER: Thank you for your question. There are 6 separate pieces in packaging. Press the mop head to the mop end. The mop head can be pulled out to remove. Screw the 2 pole sections together, push the pole end into the mop. The pole is adjustable. To adjust be sure pole is turned in “ON” position. Once desired length is achieved adjust the pole to “OFF” position. Adjust the pole to “ON” position for spinning/bucket use. Place mop in open side of bucket and press mop pole up and down to wet/rinse mop head. Place mop in spin basket side of bucket and press mop pole up and down to wring the mop head. Adjust the pole to off position to mop floors. We hope this information will be of help to you. Is this the same bucket as advertised on TV? BEST ANSWER: No it is not. I do not recommend it, my bucket leaked right away and it does not spin out very well. I would purchase the other one. 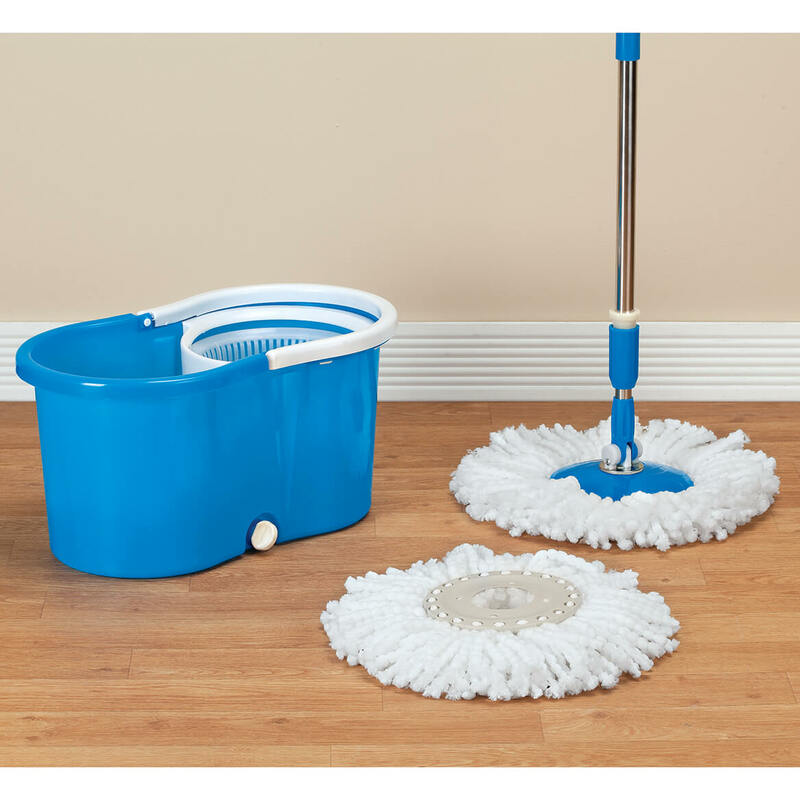 can mop be used on laminate floors ? BEST ANSWER: Yes it can be used on laminated floors but I would suggest using a light just barely warm vinegar and water solution. That is what i use and the floor is beautiful. I use it on mine all the time with no problems. I actually had one for so long I finally wore it out so when I ordered the next time I ordered two of them. mine will not spin what have I done wrong??? BEST ANSWER: Thank you for your question. 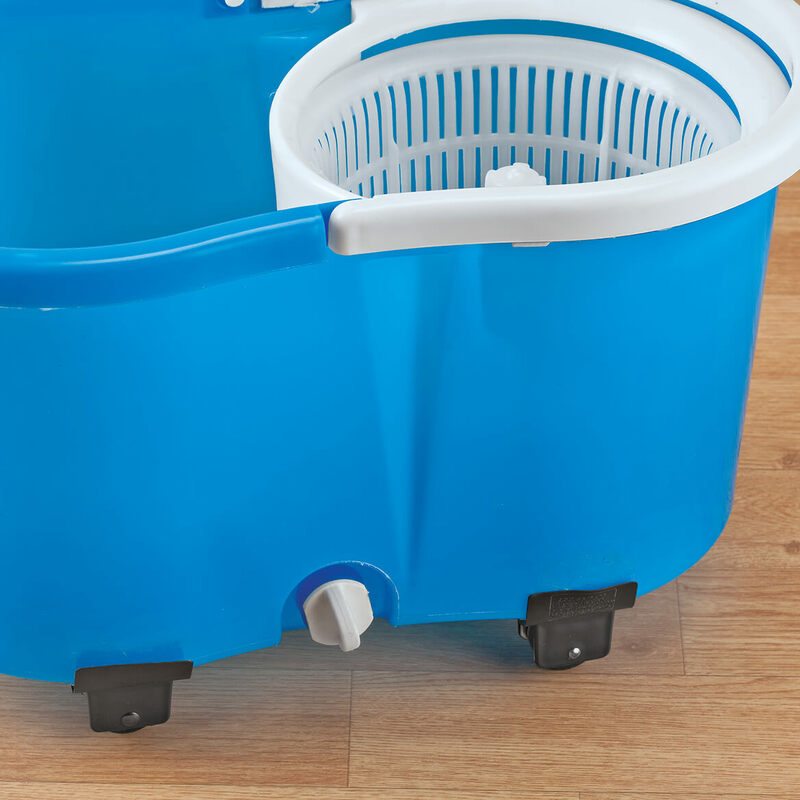 Just place the 360° spin mop in the spin bucket and press down to watch the dirt spin away. We hope this information will be of help to you. you have to loossen the handle in the middle spin tighten up! how do u remove the mop head? How big is the bucket? what about a replacement mop, i would to get a back-up mop? BEST ANSWER: Thank you for your question. The set includes one replacement mop head. We hope this information will be of help to you. can I purchase the mop only? BEST ANSWER: Thank you for your question. Unfortunately the item only comes in a set. We hope this information will be of help to you. Can you send a video on how to remove it? BEST ANSWER: Thank you for your question. We do not have the ability to send a video. We hope this information will be of help to you. I just got the mop and have used it now for about 2 weeks, now I'must having a problem with the petal, it won'the come up after I push it! Any suggestions? BEST ANSWER: Thank you for your question. Please contact our Customer Service Department for further assistance with this matter. We hope this information will be of help to you.